Exploration geochemical surveys seek to delimit exploration targets through the analyses of geochemical exploration data. Different methods have been applied in the delineation of geochemical anomalies including frequency-based and frequency space–based methods. The success of the latter methods depends on the modeling of the spatial distribution of geochemical data. However, selection of an appropriate method for modeling the spatial distribution of geochemical data remains a challenge. The main objective of this study is to address the foregoing challenge through a comparative study of inverse distance weighting (IDW), ordinary Kriging (OK), multifractal IDW (MIDW), and multifractal Kriging (MK) surface interpolation techniques. 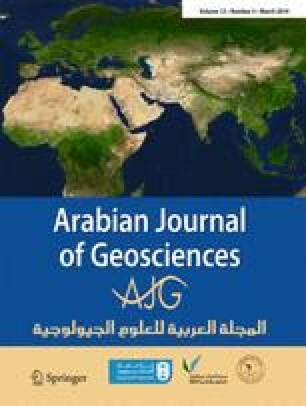 Initially, a set of composite sediment geochemical data from Feizabad district, NE Iran, was subjected to multivariate geochemical analysis by which a multielement geochemical signature, representing Cu–Au-related mineralization, was derived. Four above-mentioned interpolation techniques were applied to model the spatial distribution of the derived geochemical signature. The effectiveness of four interpolated models was compared by success-rate curves through which the MK model was recognized to be the superior model. The spectrum–area (S–A) fractal model was then applied on the MK model to decompose the anomalous component. The t student spatial statistics method was employed to determine proper threshold values by which the anomalous component could be discretized. The resultant crisp model was considered as the map of exploration targets.